At a time when the ad industry appears to be consumed with the attention consumers pay to ads in all media, new research suggests viewers are only paying attention to what’s on their TV screens about half the time. And about half of that time, they are paying attention to what’s on the “second screen” of a mobile or tablet device they are holding while watching TV. Other forms of distractions include everyday activities such as reading, eating, interacting with pets, or other people. 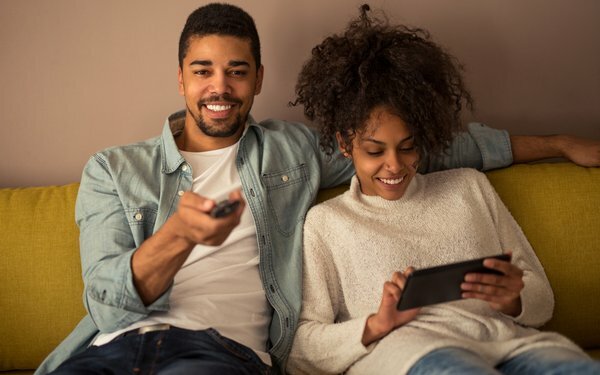 In fact, so-called “co-viewing,” watching TV with another person present, was also found to have a pronounced effect on the attention that people give to TV -- including advertising -- both positively and negatively. While both types of distractions -- hand-held devices and co-viewers -- distracted people from what they were watching, both also had some upside. The presence of a second screen reduced the amount of channel-tuning by viewers, while the presence of a co-viewer increased engagement with advertising, presumably because of conversations related to the content of the advertising. Dr. Carl Marci, executive vice president and the Chief Neuroscientist at Nielsen, who oversaw the study, said the researchers were both “surprised” and “delighted” to see the in-home studies correlated so closely with the lab studies, and said it reinforced the overall findings that second-screen devices are having a pronounced effect on TV viewing behavior, as well as cognition. Among his initial conclusions is that advertisers and agencies should probably spend more energy thinking about the “audio” content of their television ads, because the research shows that second screens keep viewers tuned to a channel during advertising, but viewers may be gazing at their second screens. Dr. Marci said the studies are an important baseline for understanding even more rampant technological changes that are beginning to affect the way people watch TV, and interact with all media, and that Nielsen and its clients are already beginning to think about how to research and measure those, including the rapid adoption of intelligent agent technology in the homes from companies like Amazon, Google and Apple that could be creating new distractions and new ways of interacting with TV too. “I don’t think there’s any question that the technology environment will continue to change,” he said, citing the rapid adoption of devices such as Amazon’s Echo as an example. “I imagine in a few years we will want to redo the study,” he said, adding that at least for the near term, the current study indicates that “the TV is on an awful lot,” but viewers may or many not necessarily be engaging with it. The CRE, which is funded by Nielsen, conducts research determined by Nielsen customers. Richard Zackon, the facilitator who runs the CRE for Nielsen’s clients, said the new research likely will begin to impact some of the core methodological thinking Nielsen uses to measure the medium in the near future. He said the CRE and Nielsen’s neuroscience team have briefed the data science team responsible for managing the company’s research methodologies to see whether they can be improved based on the new insights. While the first phase of the study indicated that in an extremely small and non-representative panel measured in the laboratory setting found that the second screen did distract people from interacting with their people-meter prompts -- the core method used in most of Nielsen’s television ratings -- Zackon and Dr. Marci said the in-home testing found it did not, and that overall there was good compliance with Nielsen’s people-meter button pushing. 7 comments about "Neuro Study Confirms 'Second Screens' No. 1 Source Of Distraction For TV Viewers, Albeit With Some Upside". Steve Sternberg from The Sternberg Report, April 19, 2017 at 11:30 a.m. I suspect that second screen use while watching TV has simply replaced other multi-tasking. If I recall correctly, the Video Consumer Mapping study released by the CRE almost 10 years ago indicated that there was significantly less multi-tasking when watching something via DVR compared to live viewing. Has the new study looked into this? Craig Jaffe from Baruch College, Zicklin School of Business, April 19, 2017 at 12:15 p.m. Questions to Dr. Marci and the CRE Neurometrics Committee: What is the statistical significance of findings from phase 2 of the study, The Mind of the Viewer? Are you using the 126 people who participated in the sample for this study to project to the U.S. TV population of approximately 325,000,000 people? Is the data more or less stable when considering specific dayparts and viewing sources? How did you determine the appropriateness of the time of year to conduct phase 2, and how do study findings vary given seasonal variations of annual TV viewership? Thank you. Ed Papazian from Media Dynamics Inc, April 19, 2017 at 12:45 p.m.
Of course a second screen---if in use while TV is being "viewed" on another screen---is a major distraction. I don't need a research study to tell me that. However, before advertisers get all fussed about improving the audio elements in their TV commercials, shouldn't we establish the average incidence of a turned on "second screen" while TV content is used. If, across all dayparts and program genres, the incidence is 50%---which I very much doubt----than this is, indeed, a big problem. If, however, this situation arises only 3% of the average person's TV viewing time---as I suspect is closer to reality---then maybe it's not a big deal after all. dorothy higgins from Mediabrands WW, April 19, 2017 at 3:33 p.m.
Other studies have demonstrated that second screen distraction does not materially lower recall compared to non-second screen users due to other distractions as Steve referenced above. One behavior that also needs to be understood is the 8-second-goldfish-attention-span reality. One may second screen during commercials but will periodically check the primary TV screen to catch program resumption. This "meerkatting" between device and TV may result in more ad-message efficacy than we are crediting. John Grono from GAP Research, April 19, 2017 at 4:57 p.m. The best method of establishing whether people are paying attention to the primary screen when co-viewing is the word "Ssssssh!" Jack Wakshlag from Media Strategy, Research & Analytics, April 20, 2017 at 3:07 p.m.
How does the amount of time of second screen multitasking compare to ten years ago? Is it that more people are using it but not any more than before? The CRE continues to do the highest quality work. Ed Papazian from Media Dynamics Inc, April 20, 2017 at 7:48 p.m.
Jack, there are some old studies that I've seen as well as newer ones by outfits such as CRE---I beleive. They tend not to be comparable due to definitional defferences, however, I would assume that the amount of dual screen "usage" is rising as more and more screens---smartphones and tablets, primarily---become available. What I've seen indicates that the actual amount of truly simultaneous "multitasking" that takes place is still very small----say around 3-4% of an average viewer's total TV "viewing" time---as opposed to what one might believe from studies that ask people how "often" they "multitask" while watching TV---with the inevitable vast overstatements that ensue.